Bonanno crime capo Vinny Asaro grinned from ear to ear as he was acquitted by a federal jury Thursday in the iconic 1978 Lufthansa heist and a slew of other Mafia crimes, including murder. 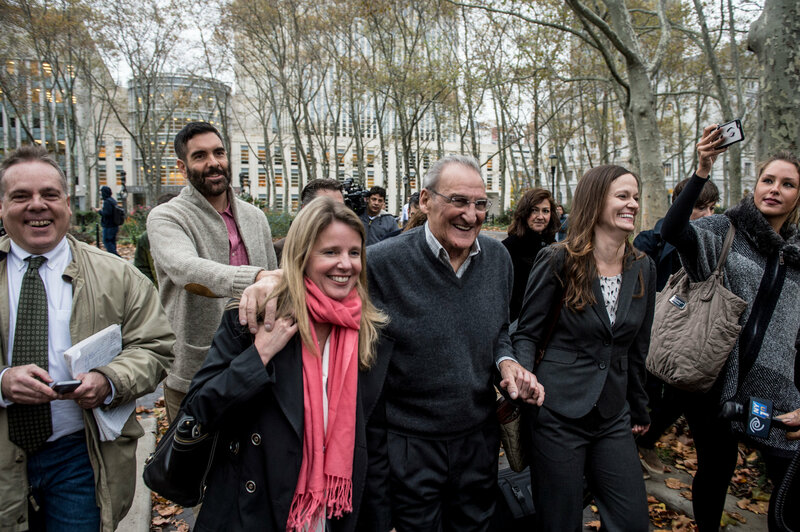 Asaro, 80, at first looked puzzled as the “not guilty” verdicts were recited in Brooklyn Federal Court. Then he leaped up from his seat with a giant smile and hugged his two lawyers. Prosecutors had argued that Asaro was heavily involved with the band of mob hoodlums who breached the Lufthansa terminal at Kennedy Airport on December 11, 1978 and emptied a vault of $6 million in cash and jewels. In addition to clearing him on that score, jurors also cleared Asaro of any role in the grisly 1969 slaying of Paul Katz, a reputed mob associate who was suspected of being an informant. The man described by a Brooklyn federal prosecutor as “the ultimate tough guy” and who once fraternized with mafia legends like John Gotti has now dodged the prospect of life in prison. Asaro has now had the last laugh against his cousin, Gaspare Valenti, who’d been key to the prosecution case and who still faces up to 20 years in prison under his federal agreement to cooperate against Asaro. Broke and disillusioned with the mafia grind, Valenti turned rat in 2008 and later began wearing a wire during countless conversations with Asaro and others. Valenti, who has already pleaded guilty to involvement in the Lufthansa heist, gave jurors an intimate tour of the planning, execution and aftermath of the robbery. The turncoat also told jurors that he exhumed Katz on his cousin’s orders. Asaro’s defense attorneys, Diane Ferrone and Elizabeth Macedonio, may well have succeeded in discrediting Valenti and other mafia songbirds who took the stand, blasting them as professional rats who were motivated to lie in exchange for government money. But federal prosecutors Nicole Argentieri, Lindsay Gerdes and Alicyn Cooley told the panel that the evidence against Asaro was overwhelming and that the cooperators’ testimony was supported by the evidence in the case. The three-week trial in Brooklyn federal court vividly brought many of the characters from the famed film classic to life.